Leeds United may have been playing away at Wigan last week, but there was one fixture at Elland Road stadium that could prove a winner for anyone transporting visually impaired passengers. 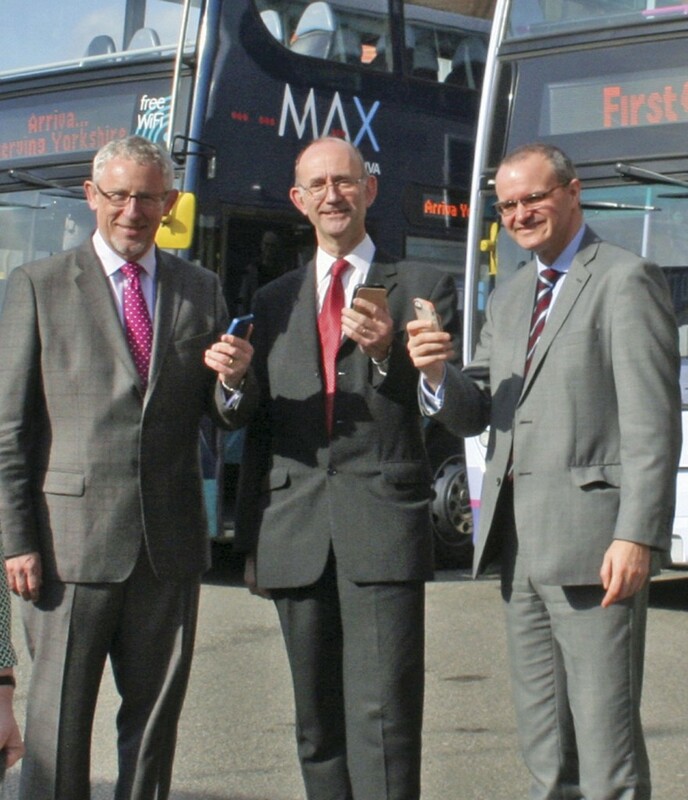 First and Arriva, in partnership with the Confederation of Passenger Transport UK (CPT), joined forces and launched a bus stop announcement app for blind and visually impaired passengers at the sports arena. The Next Stop Announcement smartphone app is now on an eight week trial in Leeds and the local area until 1 May. 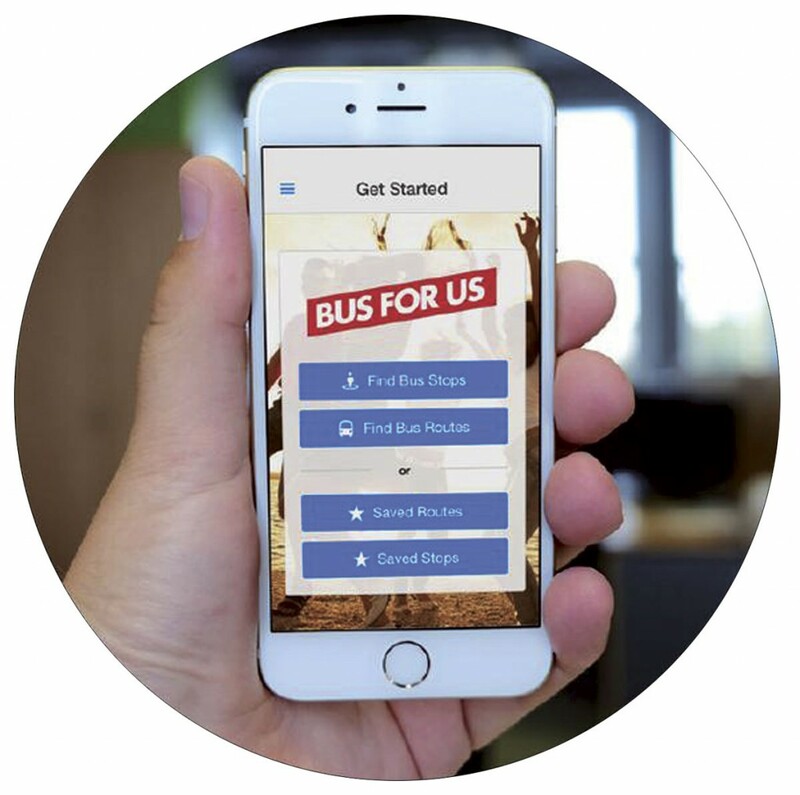 Branded as part of the ‘Bus for Us’ umbrella (CPT’s journey planning website), the app has been created and developed specifically for blind and visually impaired bus passengers. It provides users with real time audio and visual alert notifications direct to the handset. It is designed to ensure passengers know where they are on a journey and at which stop to get off. 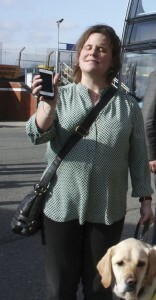 Users plug in earphones and like other smartphone apps for visually impaired, they can cast their finger over the touch screen and ‘hear’ the buttons, double tapping on the screen to press individual buttons. It provides the user with information on the progress of the service, where the next stop will be, making use of the voice over and GPS functions of smartphones. Having taken six months to develop, it also offers simple and easy to search and navigate route maps together with next service information and a facility to save favourite and frequently used stops and bus routes. The app runs on service and route data that already exists within the industry, with the trial version featuring all of First’s and Arriva’s service details in the Leeds area. First operates routes in the city itself, with Arriva running buses into the city from outlying towns and villages. Head of Commercial Development at First, Mark Smith, said the city was used for the trial because of the good quality of timetable information available. One interesting feature is if there is a diversion to a service that has not been programmed into the system, it will pick up again once it has come back onto the scheduled route. It is currently available as a beta version, which means it is not freely available to anyone on Apple’s app store or other app providers during the trial. Those wishing to receive it must be provided a website link to it to download. In the future, there is the possibility for it to do things other than just track bus stops, adding functionality. As well as First and Arriva, there is a possibility for it to be rolled out to other operators’ services. However, the pilot is only being carried out on the two mentioned companies’ buses. The pilot is free to download, but a decision on whether the final version of it will be is yet to be made. He thanked the DfT, who helped develop the app and Claire Randall, who is visually impaired and actually trialled it in London prior to its launch in Leeds. He explained that CPT is committed to making buses as accessible as it can and raised the point that buses are ‘unrecognisable’ in terms of accessibility from only ten to 15 years ago. He said there are some fleets with audio-visual announcements to assist the blind, but not as many as hoped. He said operators need to fund this equipment, so admitted that it will be many years before this happens. In the meantime, a simple solution was needed, hence the launch of the app. Next to speak was Claire Randall, who said she was very fortunate living in London in terms of the next bus announcements on board all TfL services. However, she travels around the country a lot and often finds the experience very ‘disconcerting’ due to lack of information onboard. Providing AV next stop information to assist blind and other disabled people is, without a doubt, something the industry is keen to roll out. However, in times when funding for such costly onboard equipment is not readily available, the Next Stop Announcement smartphone app provides a good alternative. It is important to remember the app is not just of benefit to the blind, as anyone unfamiliar with the area or who have simply not used that service before may well find it useful, especially if no onboard AV equipment is available. However, one stumbling block could be the fact not everyone has a smartphone. Unless 100% of visually impaired passengers start using these mobile devices, then there will always need to be onboard AV equipment to ensure they are all served equally.